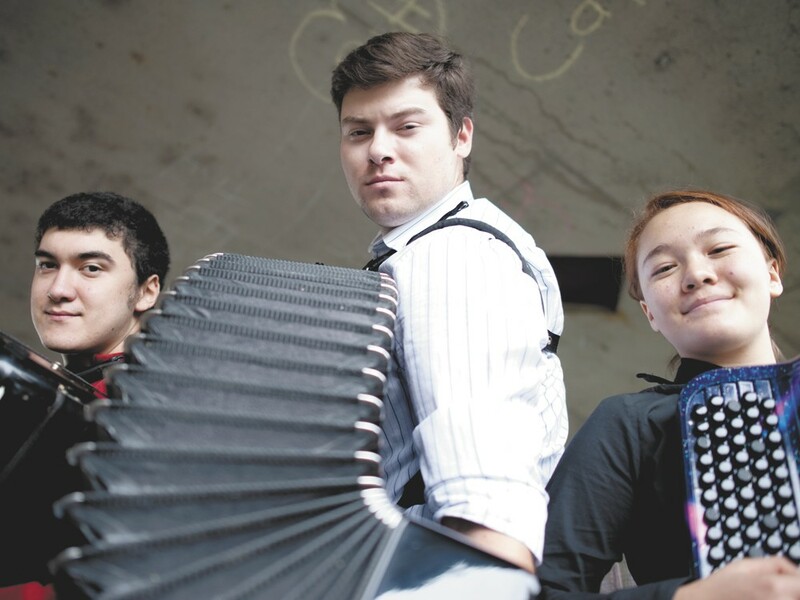 FROM LEFT: Gabriel Soileau, 16, Yevgeniy Nosov, 24 and Naomi Harris, 12, all qualified for the 2012 World Trophy Accordion Championships. Gabe Soileau doesn’t always bring his accordion to school. It’s heavy, cumbersome and the 16-year-old high school junior doesn’t usually need it. But on the occasions when he does whip it out for his classmates, they try to toss money at him. Playing the accordion is actually kind of cool right now. Soileau is, after all, starting a folk band centered on his accordion while also practicing classical pieces on the instrument. Also, pop music acts like Arcade Fire feature it prominently on stage. See, it’s cool. Or at least Soileau is cool with it — cool enough to be one of five Americans competing in next week’s World Trophy Accordion Championships (or as the rest of the world is calling it, Trophee Mondial de l’Accordeon), taking place right here in Spokane, a place where the accordion, unlike in Europe and parts of Asia, isn’t taken all that seriously. “In America, for some reason, there’s more of a connotation to it that it’s a toy instrument. Maybe they think of The Lawrence Welk Show. It’s getting really popular around the world. It’s getting really classy,” says Soileau, perhaps the only teenager in America who can readily reference Lawrence Welk. It’s the first time that the competition, now in its 62nd year and boasting $20,000 in prize money, has taken place in the United States. The field of 50-plus competitors is tremendously international, with 17 different countries represented. Of the five entries from the competition’s host country, four are from Spokane. Maybe that fact would better explain away any shock that an accordion championship competition is happening here. Somehow, Spokane has become an accordion hotbed. Well, we’ll use “hotbed” loosely here. Patricia Bartell, the president of World Trophy Accordion USA, was instrumental in bringing the competition to the hometown where she earned her degree in — believe it or not — accordion, and teaches the instrument to about 50 students in the Spokane area. She began playing accordion when she was 8 years old and has made it her life’s mission to make the instrument more than a mere novelty here in the U.S. A former third-place winner in the competition, she’s also traveled to Italy, Portugal and Bosnia as the U.S. judge. So yeah, she knows her accordion and says the timing is excellent for the U.S. to host the biggest accordion event on Earth. “We like to think of it as a polka instrument, which is great, but the status of the accordion has always been really low. But right now, accordion is making a comeback,” says Bartell, 34, who designed her own accordion major while a student at Whitworth University and now runs the Able to Play studio inside the Music City on Monroe Street. Sure, the accordion might bring to mind visions of Weird Al or Steve Urkel (or for some, Mad Men’s Joan) or, like Bartell says, a polka band, but the accordion was a serious instrument in the years before and after World War II. Now, this competition would like to remind you that it’s still serious. The championships consists of five days of concerts and solo competitions, kicking off with a performance by the Spokane Symphony, accompanied by accordion. We don’t think of classical music and the accordion marrying all that sweetly, but that’s hardly the case. The opening show on Tuesday night at The Fox features a never-before-heard piece performed by the Symphony and former World Trophy winner Grayson Masefield. The 25-year-old Australian is a virtuoso of the accordion who has retired from competition, likely to the pleasure of the competitors who will be taking in his performance at The Fox. Soileau, Spokane’s own accordion wunderkind, isn’t sure what to expect from the competition. It’s far and away the biggest stage he’s ever played on. He’s hoping to not just hold his own with his international opponents, but also shatter the stigma surrounding his chosen instrument. Before it was forever linked to folk music and the polka, the accordion had already experienced a long life, first appearing roughly 4,500 years ago in China. This marked the birth of the vibrating reed instrument’s ancestor, previously called the Cheng. The Cheng would find its way to Vienna and into the hands of Cyril Damian who engineered the first accordion in 1829. This edition of the accordion bears little resemblance to its modern form, lacking shoulders straps and forcing the player to hold the heavy object, leaving only two to three fingers to play with on either hand. The modern accordion, complete with piano style ivory keys and shoulder straps, would emerge in 1863, liberating musicians and later becoming an installed part of poplar music. The instrument has been seen in contemporary music, with acts such as Arcade Fire, Beirut, Flogging Molly, Bob Dylan, Tom Waits, the Rolling Stones and The Beatles all featuring the accordion in some way.